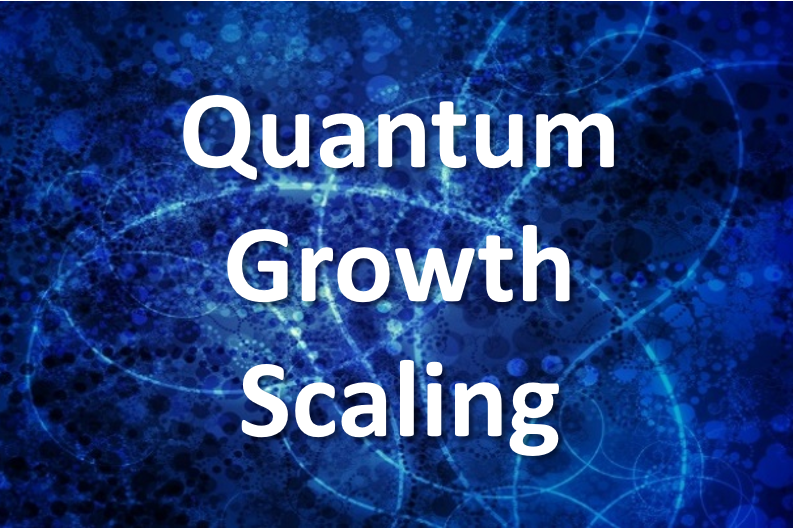 The Quantum Growth SCALE consulting service is designed for small and medium-sized business owners to create a quantum leap with their enterprise by acquiring and integrating tried-and-tested strategies, methods and tools needed to expand their business and scale with velocity. The following materials outline the key components of the service. To download our Quantum Scale Whitepaper, click here. Fledgling businesses and first-round funded start-ups must rapidly scale-up by building a superlative leadership culture, implementing solid accountability and performance protocols and seizing the competitive advantage in the marketplace. While these are the obvious challenges, it is how they are dealt with that makes or breaks a growing enterprise. 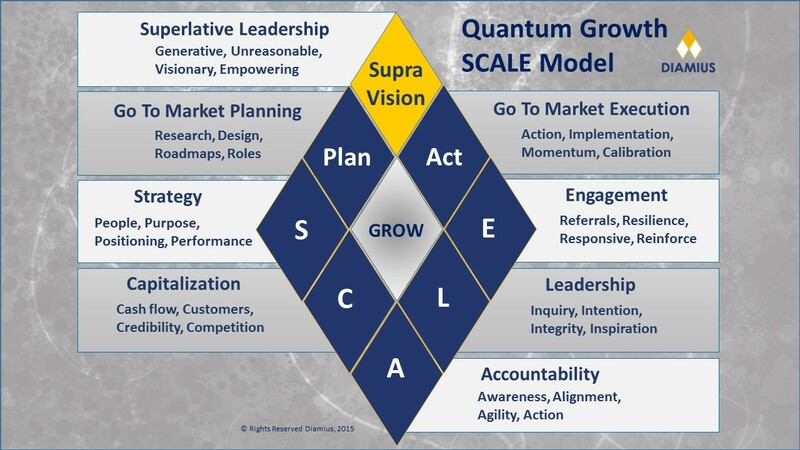 First, there are four factors that must be navigated with precision to ensure rapid, responsible and profitable scaling for any enterprise. They are, Superlative Leadership Culture, Accountability Performance Benchmarking, Dynamic Management Engagement, and Compelling Marketing Presence. Our seasoned consulting team will equip you with the tools, skills and experience needed to navigate these four factors and scale-up your enterprise with confidence. Your co-mentor team, Val Jon Farris and Elizabeth (Eli) Davidson are world-class professionals. They are recognized experts in the arenas of both personal and professional development and work with a wide range of entrepreneurs and business owners from around the world. As an example they are currently official mentors and advisers for Richard Branson’s XTC Academy, which empowers visionary entrepreneurs the world over to scale-up their enterprises and operate on a global level. Val Jon is a well-respected corporate leadership curriculum designer and has mentored and trained thousands of Fortune 50 executives, country leaders and professionals over a thirty-year span. He is also a well-respected self-development workshop leader, published author and featured columnist for The Huffington Post. Companies such as Oracle and HCI sponsor Val Jon to lead virtual leadership programs for L&D,and OD and HR Executives from a wide range of companies from around the world. Elizabeth is a rapid business growth expert and has mentored professionals from around the world. She is on Sir Richard Branson’s Advisory Counsel for the XTC Academy, which empowers visionary entrepreneurs the world over. Her renowned “turnaround techniques” have been featured on The Today Show, Dr. Phil’s Decision House, SELF Magazine, New York Times, the Huffington Post and CNN in 134 Nations. Her clients include Women Inc. 500 CEOs, Emmy, Grammy, Oscar winners as well as many A list celebrities. Joan and Melissa Rivers filmed breakthroughs with Elizabeth on their show, Joan Knows Best. International Trainer, Speaker, Author, Sanderson Consulting, Inc.
"The Diamius SCALE consulting sessions have been priceless. They provided clear concise steps with specific well-defined guidance. The facilitator’s involvement during the Q & A sessions inspired the process to move forward at a rapid pace, for this alone it was a Godsend." Principle at Meader Consulting, Meader Consulting, Inc.